Scallions (also known as green onions, spring onions, or salad onions) are vegetables of various Allium onion species. Scallions have a milder taste than most onions. Their close relatives include garlic, shallot, leek, chive, and Chinese onion. 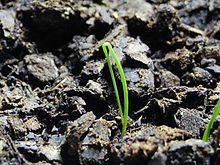 Although the bulbs of many Allium species are used as food, the defining characteristic of scallion species is that they lack a fully developed bulb. Allium species referred to as scallions have hollow, tubular green leaves growing directly from the bulb. These leaves are used as a vegetable; they are eaten either raw or cooked. The leaves are often chopped into other dishes, in the manner of onions or garlic. The words scallion and shallot are related and can be traced back to the Greek ασκολόνιον ('askolonion') as described by the Greek writer Theophrastus. This name, in turn, seems to originate from the name of the ancient Canaan city of Ashkelon. The plant itself came from farther east of Europe. A. cepa var. cepa – Most of the cultivars grown in the West primarily as scallions belong to this variety. However, the "scallions" from A. cepa var. cepa (common onion) are from a young plant, harvested before a bulb forms or sometimes after slight bulbing has occurred. A. cepa var. aggregatum (formerly A. ascalonicum) – commonly called shallots or sometimes eschalot. A. fistulosum, the Welsh onion – does not form bulbs even when mature, and is grown in the West almost exclusively as a scallion or salad onion, although in Asia this species is of primary importance and used both fresh and cooked. Spring onions may be cooked or used raw as a part of salads, salsas or Asian recipes. Diced scallions are used in soup, noodle and seafood dishes, sandwiches, curries and as part of a stir fry. In many Eastern sauces, the bottom half-centimetre (quarter-inch) of the root is commonly removed before use. In Mexico and the Southwest United States, cebollitas are scallions that are sprinkled with salt, grilled whole and eaten with cheese and rice. Topped with lime juice, they are typically served as a traditional accompaniment to asado dishes. In Catalan cuisine, calçot is a type of onion traditionally eaten in a calçotada (plural: calçotades). A popular gastronomic event of the same name is held between the end of winter and early spring, where calçots are grilled, dipped in salvitxada or romesco sauce, and consumed in massive quantities. In Japan, tree onions (wakegi) are used mostly as topping of Japanese cuisine such like tofu. In Vietnam, Welsh onion is important to prepare dưa hành (fermented onions) which is served for Tết, the Vietnamese New Year. A kind of sauce, mỡ hành (Welsh onion fried in oil), is used in dishes such as cơm tấm, bánh ít and cà tím nướng. Welsh onion is the main ingredient in the dish cháo hành, which is a rice porridge used to treat the common cold. In India, it is eaten as an appetizer (raw) with main meals. In north India, coriander, mint and onion chutney are made using uncooked scallions. In the United Kingdom, scallions are normally chopped and added to mashed potatoes, or as an added ingredient to potato salad. In the southern Philippines, it is ground in a mortar along with ginger and chili pepper to make a native condiment called wet palapa, which can be used to spice dishes or as a topping for fried or sun-dried food. It can also be used to make the dry version of palapa, when it is stir fried with fresh coconut shavings and wet palapa. During the Passover meal (Seder), Persian Jews whack each other with scallions before singing the song Dayenu, symbolizing the whips endured by the Israelites under the ancient Egyptians. An oil, scallion oil, is sometimes made from the green leaves. The leaves are chopped and lightly cooked then emulsified in oil which is used as a garnish. Green onions are one of the two major crops (along with sweet potatoes) of Liu'ao Peninsula in Fujian. Scallions have various other common names throughout the world. These names include spring onion, green onion, table onion, salad onion, onion stick, long onion, baby onion, precious onion, yard onion, gibbon, syboe and shallot. Scallion and its many names can be mistakenly used for the young plants of the shallot (A. cepa var. aggregatum, formerly A. ascalonicum), harvested before bulbs form, or sometimes after slight bulbing has occurred. Afghanistan – Known as "shna pyaz" meaning "green onion"
Albania – Known as qepë të njoma meaning "young/baby onions"
Australia – The common names are "spring onions" and "shallots". Bangladesh – In Bangla it is known as পেঁয়াজ পাতা, which means "onion leaf" or "onion leaves". Belgium – In the Dutch speaking part, it is known as "pijpajuin", which means "tubular onion". Bosnia and Herzegovina – Known as "mladi luk". Brazil – Known as cebolinha, which is also the Portuguese word for chives. A more precise term is cebolinha-verde which refers specifically to A. fistulosum. 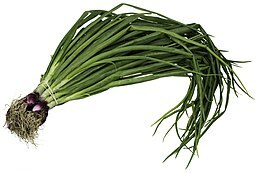 Caribbean – Often referred to as "chives"
China – The common name is cōng (葱); xiǎocōng (小葱) is another term for scallion. Colombia – Known as "cebolla larga"
Costa Rica – Usually "cebollín"
Croatia – "mladi luk", meaning "young onion"
Dominican Republic – Known as "cebollín"
Ecuador – Known as "cebolla larga"
England and some Commonwealth countries including Singapore the most common name is "spring onion"
France – Known as "oignon vert" (literally "green onion"), "ciboule" and "cébette"
Germany and Austria – Known as Frühlingszwiebel (among other names), which means "spring onion". India – May be referred to as "spring onion", and in Hindi-speaking areas as hara pyaz. In the eastern state of West Bengal, spring onions are referred to as "গাছ পিঁয়াজ" ( literally meaning "tree onions"). In Maharashtra, they are referred to as “उळपात” or “कांदा पात” (literally meaning “onion leaves). Indonesia and Malaysia – Known as daun bawang (onion leaf). The same term is used for leeks (daun bawang perai). Chinese chives which can be mistaken for scallions are called daun kucai. Israel – Known as batzal yaroq (בצל ירוק), which means "green onion"
Iran – Known as پیازچه. Ireland and Northern Ireland – the term "scallions" is commonly used. Italy – Known as cipolla d'inverno ("winter onion"), cipollotto or cipolletta, which means "little onion", "cipollotti freschi" (fresh little onions), or cipolla verde ("green onion"). Jamaica – Known as escallion and refers to Welsh onion. Korea – Known as pa (파); larger variety of Allium fistulosum called daepa (대파, "big scallion"), thinner early variety called silpa (실파, "thread scallion"); Allium × proliferum called jjokpa (쪽파). Kyrgyzstan – Known as көк пиаз, which literally translates to "blue onion". Latvia – Known as sīpolloki. Lithuania – Known as laiškinis svogūnas in Lithuania, which means "leafy onion". Netherlands – Known as bos ui, which literally translates as "bundle onion", or lente ui, which translates as "spring onion". New Zealand – The common name is "spring onion". Norway – Known as vårløk (bokmål) or vårlauk (nynorsk). Peru – The common name is cebolla china which means "Chinese onion" in Spanish. Philippines – Known as sibuyas na mura. It is also called berdeng sibuyas. Quebec - Known by Francophones as échalotte, which is also the Standard French word for shallot. To distinguish the two, Franco-Québécois call the true shallot échalotte française. The Quebec English word for scallion is also "shallot", a calque of the Quebec French word; it is pronounced with the stress on the last syllable, as in échalotte. Romania – Known as ceapă verde, which means "green onion"
Russia – Known as зеленый лук, which means "green onion"
Scotland – known as "spring onion", and also in Scots as cibies or sibies, from the French syboe. Serbia – Known as mladi luk, which means "young onion"
Slovakia – Known as 'cíbiky', which is an irregular diminutive of "onions" (pl.) or simply 'jarná cibula' which means 'spring onion'. Spain – Known as "Cebolleta". In the little city of Valls (Catalonia), there's a local traditional variety of sweety onion named Calçots. Sweden – Known as salladslök (in Swedish) ("salad onion") as a general name for onions with not yet fully developed bulbs, and piplök ("pipe onion") when referring to A. fistulosum. The term vårlök ("spring onion") is sometimes also used, but that is a misnomer caused by translating the English "spring onion". Vårlök is the Swedish name for Gagea lutea, which is inedible and not an onion at all. Turkey – Known as taze soğan, meaning "fresh onion"
United States – Known as "scallion" or "green onion" except for the New Orleans area where it is known as shallot. The term "green onion" is also used in reference to immature specimens of the ordinary onion (Allium cepa) harvested in the spring. United Kingdom and some Commonwealth countries including Singapore the most common name is "spring onion"
Vietnam – Known as "hành lá", which means "leaf onion"/"scallion" ("lá" means "leaf"), in order to distinguish with "hành tây" which means "onion"
Wales – known as "spring onion" or "jibbon" /ˈdʒɪbən/. Also known in South Wales as sibwn (pronounced "shibun"), from the French syboe. ^ "AllergyNet—Allergy Advisor Find". Allallergy.net. Archived from the original on 15 June 2010. Retrieved 14 April 2010. ^ Rombauer, Irma; Rombauer-Becker, Marion; Becker, Ethan (2006). "Know Your Ingredients". Joy of Cooking (hardcover)|format= requires |url= (help). New York City: Scribner. p. 1004. ISBN 978-0-7432-4626-2. ^ Allium Crop Science: recent advances at Google Books, last retrieved 2007–03–31. ^ Fritsch, R.M. ; N. Friesen (2002). "Chapter 1: Evolution, Domestication, and Taxonomy". In H.D. Rabinowitch and L. Currah (ed.). Allium Crop Science: Recent Advances. Wallingford, UK: CABI Publishing. p. 20. ISBN 0-85199-510-1. ^ Fritsch, R.M. ; N. Friesen (2002). "Chapter 1: Evolution, Domestication, and Taxonomy". In H.D. Rabinowitch and L. Currah (ed.). Allium Crop Science: Recent Advances. Wallingford, UK: CABI Publishing. p. 18. ISBN 0-85199-510-1. ^ Brewster, James L. (1994). Onions and Other Vegetable Alliums (1st ed.). Wallingford, UK: CAB International. p. 15. ISBN 0-85198-753-2. ^ Cebollitas, last retrieved 2012–09–01. ^ At the Nation's Table: Chicagoat New York Times Archives, last retrieved 2012–09–01. ^ Grilled Green Onions with Romesco, last retrieved 2012–09–01. ^ "An Iranian Seder in Beverly Hills". The New York Times. ^ "About Scallions in Lithuanian"